Voice-Actions on Android Look Great - Star Trek Quality! Voice-Actions on Android Look Great – Star Trek Quality! Google may have hit a homerun with the development of its latest App for Android phones. Their Voice Search application now features ‘voice-actions’ which allow the user to perform a variety of tasks on their phone just by speaking. Text messages, emails, web searches, music, alarms, personal messages, maps, and calls can now all be accessed with voice commands. It’s a pretty impressive list of actions to have at your fingertips lips. Not only are the available actions comprehensive, the actual speech recognition quality seems really top notch. Check out the demonstration video for voice-actions below. If you’re an US English speaker with an Adroid 2.2 (Froyo) phone you can download it right now. The rest of us will have to wait. It’s unclear if the “set alarm” command seen in the video (~1:38) is available at the moment and/or if it was merely forgotten by the blog. Looking at the above list, there are some functions that Google’s left out. Can you set your calendar? That would be pretty important for those who want to leave themselves quick reminders about events. It would also be nice to be able to pull up photo albums or favorite videos so that you could share these quickly with friends. Ultimately I would also want voice actions to be used in other applications, if for no other reason that I want to defeat my chess app by saying cool things like “knight to king’s four”. Part of what makes Siri on the iphone so helpful is that it can handle a variety of phrases in reference to the same command. “Find food” and “locate a restaurant” are generally going to get the same result. It’s unclear at this point if the Google voice-actions have to use the exact words listed above, or if there’s some flexibility. Ideally we’d have programs that can completely handle natural speaking. Siri comes close but has its limitations. Google will have to do at least as good if it wants to compete. In Star Trek, characters could ask the computer any question and get a helpful response. Well, if the Enterprise wasn’t experiencing weird glitches at the time (that happened a lot, didn’t it). Already our current system of voice commands is pretty impressive. With voice search, the power of the internet is easily accessible, and that’s no small thing. It took me all of two seconds to find the “etymology of silhouette” (don’t ask why, it involves a tea house), something that it would have taken me twenty minutes and a trip to the library to find out fifteen years ago. Who knows, in another fifteen years I may be able to get such knowledge piped directly in my brain. 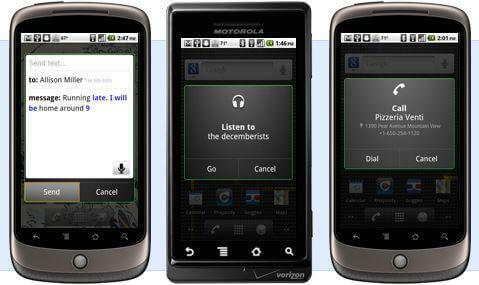 It sounds outlandish but the reverse, commanding phones with the brain, is already under development. Voice commands represent a big step in bringing the power of computers into the human frame. It’s only going to get weirder and better from here.